Your browser does not support the video tag. Ingredients 2 1/2 cups all purpose flour 1 teaspoon baking powder 1 teaspoon baking soda 1/4 teaspoon salt 3/4 cup Lactantia® European Style Unsalted Butter, melted 1 1/2 cup sugar 1 egg 1 teaspoon vanilla extract 1 1/2 cups sweetened shredded coconut 2 bags of chocolate egg candies Instructions Preheat oven to 350ºF and lightly grease 24 muffin tins. In a medium bowl, whisk together flour, baking powder, baking soda and salt, then set aside. 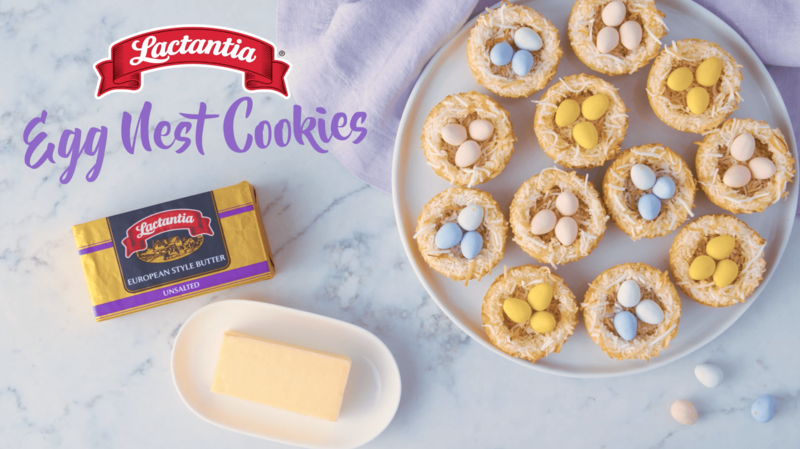 In a separate bowl, cream together melted Lactantia® European Style Unsalted Butter and sugar on medium speed with an electric mixer. Add 1 egg and vanilla extract, then mix until combined. Gradually add the flour mixture to the wet ingredients, and mix on low speed until dough forms. Divide the dough among the muffin tins, pressing into the bottom of each mold, then sprinkle evenly with shredded coconut. Bake the cookie nests for 11-13 minutes, or until coconut starts to brown. Allow the cookie nests to cool almost completely. Then, twist gently and insert a thin knife down the side to remove them from muffin tin and transfer to cooling rack. When completely cooled, place three egg candies in each nest. Preheat oven to 350ºF and lightly grease 24 muffin tins. In a medium bowl, whisk together flour, baking powder, baking soda and salt, then set aside. In a separate bowl, cream together melted Lactantia® European Style Unsalted Butter and sugar on medium speed with an electric mixer. Add 1 egg and vanilla extract, then mix until combined. Gradually add the flour mixture to the wet ingredients, and mix on low speed until dough forms. Divide the dough among the muffin tins, pressing into the bottom of each mold, then sprinkle evenly with shredded coconut. Bake the cookie nests for 11-13 minutes, or until coconut starts to brown. Allow the cookie nests to cool almost completely. Then, twist gently and insert a thin knife down the side to remove them from muffin tin and transfer to cooling rack. When completely cooled, place three egg candies in each nest.